Russia. Rostov-on-Don. Memorial Complex In Honor Of The Liberation Of Rostov-na-Donu. Theatre Square. Photo title: Russia. Rostov-on-Don. 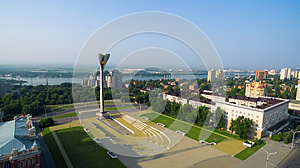 Memorial complex in honor of the liberation of Rostov-na-Donu. Theatre Square.